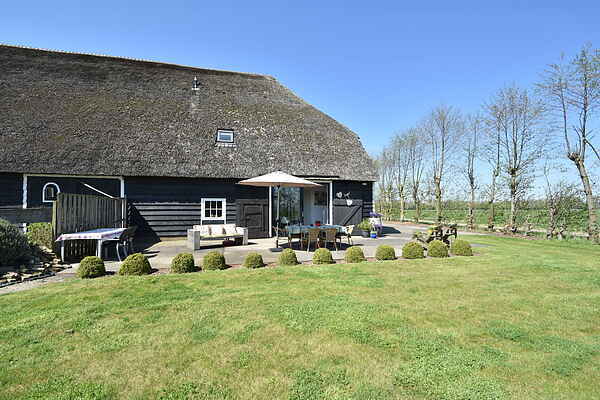 This charming holiday home lies in Veerse Meer-Kamperland, within a fifteen-minute cycle of the Veerse Meer. The holiday home, situated in the back part of the monumental Zeeland farmer's barn, is beautifully remodeled to a comfortable and luxury holiday accommodation while maintaining the authentic style elements. You share the entrance with the guests of the other holiday home, which is also located in the back part of the barn. However, you have plenty of privacy, because the terraces are located on different sides of the building. The owner lives in a house on the front side of this very spacious property. Around the house there is a lot of room for children to play; they can go wild on the trampoline, play some mini-gold or go-carting. There are many animals in the vicinity, such as chickens, peacocks, and deer. You can walk across the dyke to the hospitable village Kamperland within fifteen minutes, where you won't only find nice shops, but also a beer brewery. The nearby located Veerse Meer is especially loved by those who enjoy water sports and by fishermen. There is a small beach where you can relax in the sun. The North Sea beach at the Banjaard/Kamperland lies only a five-minute drive away. Please note: No baby cot available in the property only a chair for one child.